Safety and environmental considerations must be taken into account when disposing of old electrical household appliances. Computers, televisions, stereos, refrigerators, water heaters, and many other smaller electrical appliances are wonderful life-enhancing conveniences. But when the time comes to replace and dispose of them, they can become a dangerous nuisance and hazard if not discarded properly. Unfortunately, many second-hand unsafe appliances wind up in other people’s homes as electrical shock or fire hazards, or illegally dumped in ditches, back alleys, vacant lots or other places where they become serious safety and environmental hazards. 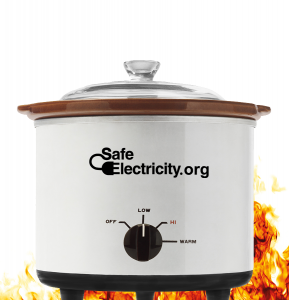 Safe Electricity warns people to never attempt to use a malfunctioning or previously discarded electric appliance, and to beware of old appliances sold in flea markets and garage sales. Such appliances may pose a fire or electrocution hazard, and may be no ‘bargain’ in the long run. Managing the safe disposal of the vast amount of electrical appliances that wear out, become obsolete or damaged can be a challenge but, there are safe disposal alternatives. Take advantage of local recycling opportunities. Before throwing away electronics, check on programs that collect and repair unwanted phones and computers for contribution to charitable organizations and schools. Many communities sponsor collection events that accept electronic appliances. However, be aware that stringent state and federal laws now govern the disposal of many electrical appliances. Most electronics have parts that contain hazardous materials, such as lead, mercury, arsenic, cadmium, PCBs and Freon. In most states, landfills can no longer accept certain appliances unless banned materials and components are first removed. Have a qualified professional remove Freon, PCBs and mercury switches from old appliances. For assistance, contact your local public works department or appliance service provider. After removal of unsafe materials and components, arrange to have the old appliance taken to a scrap yard where the metal can be salvaged for recycling. High steel prices have made old appliances attractive to scrap dealers. Never leave or store an unused or damaged appliance in an open, unsecured area. Discarded appliances are a safety hazard, especially for children. In addition, discarded appliances may provide shelter or a breeding place for vermin. Before disposal, remove electrical cords from damaged items so not recycled and reused by someone else. If larger household items, such as washers, dryers, stoves and refrigerators, need to be replaced, have the dealer remove the old appliance. Don’t keep old inefficient appliances that are costly to operate and will pose a future disposal problem. Replace old, worn appliances with new, high-efficiency models but, make certain that all new electrical equipment you purchase is safety-tested and bears the Underwriters Laboratories (UL) label.